Easy, comforting casseroles are just about my favorite thing in the winter months. It’s cold and I don’t always feel like putting a lot of work into dinner. And casseroles can often be the easiest of dinners. Also, it’s so nice having dinner cook away in the oven, warming up the house and smelling good while I wait for dinner. This casserole fits the bill! And it has polenta, which gets it extra points in my book. I post a lot of creamy polenta recipes on this site, but I think not nearly enough recipes that use a polenta tube. And polenta tubes are a great thing, because most of the work is already done for you. In this particular recipe, all you need to do is slice it! The polenta in this casserole is layered with some saucy white beans and tomatoes. Most of the work involved is in preparing the white beans and tomatoes, and it’s really not very much work at all! Cook an onion in some oil for a few minutes to soften it up. Next add some garlic and let it cook briefly, before adding some white wine and herbs. Let the wine simmer and reduce for a few minutes. 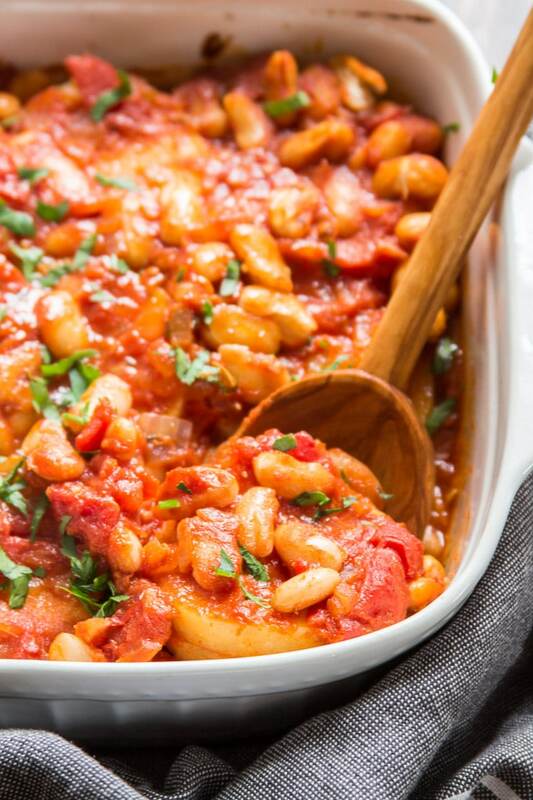 Add your tomatoes and beans, and simmer a few minutes longer. 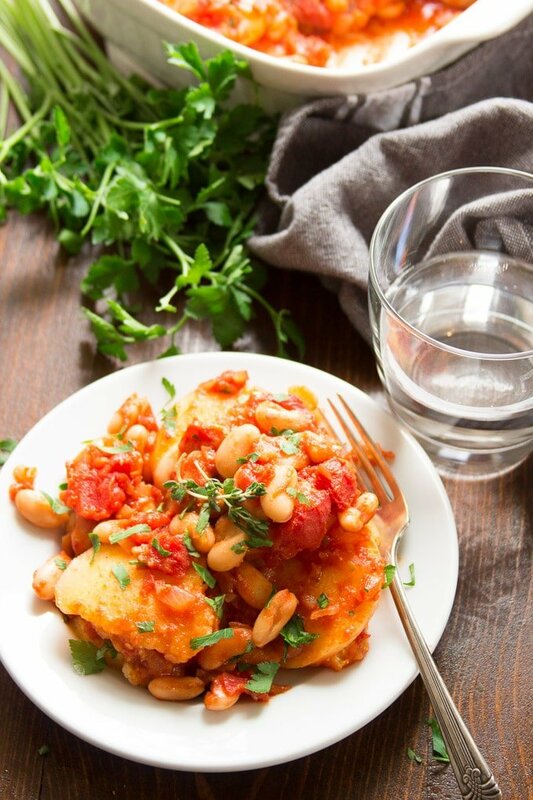 Grab an 8 x 8 baking dish and ladle a bit of white bean-tomato mixture into the bottom. All you have to do from there is layer. 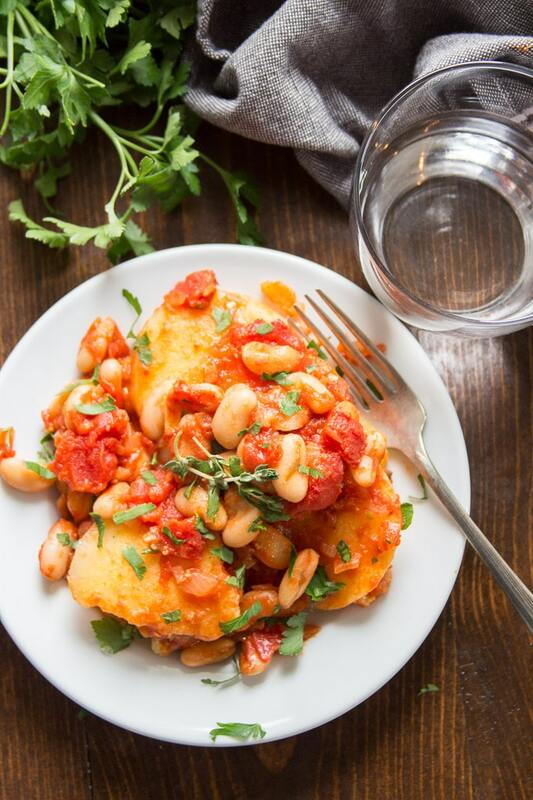 Arrange half of your polenta slices over the mixture, followed by another layer of bean-tomato mixture, the rest of the polenta, and a final bean-tomato layer. Cover the dish and bake for 30 minutes. Then uncover, and if you’d like, arrange some vegan cheese on top (I didn’t bother) and bake another 10 minutes, until bubbly. Let it cool for a few minutes, scoop onto plates and dig in. Feel free to top your casserole with vegan cheese if you like. I did not, but I bet some shredded mozzarella or provolone slices would be nice. 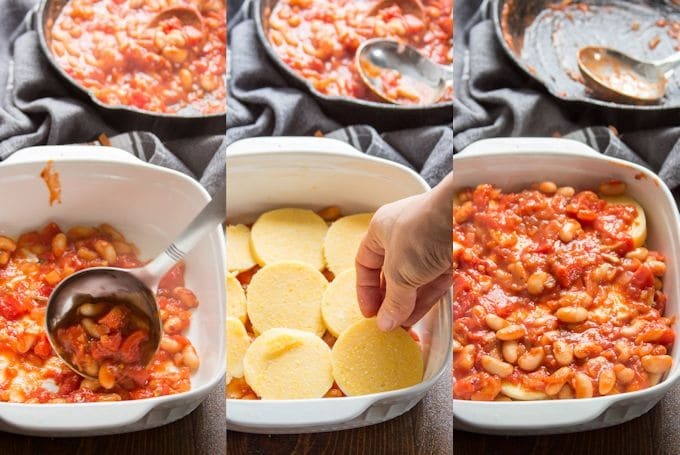 You can pan-fry the polenta slices before assembling the casserole if you like. I’ve made this casserole both ways, and while pan-fried polenta makes it extra delicious, I decided it wasn’t worth the additional oil and dirtying another pan. Can I leave the wine out? It adds a lot of flavor, but you can absolutely leave it out if you prefer. Is this recipe gluten-free? It sure is! The longer you let this sit before serving, the more it’ll hold it’s shape when cut. The casserole in the photos was scooped out of the pan relatively soon after baking. Leftovers will keep in a sealed container in the fridge for about 3 days. 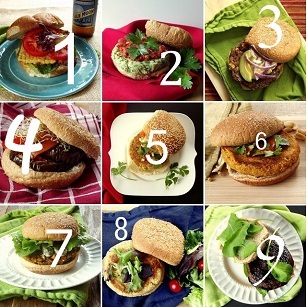 Check with Barnivore to ensure the wine you use for this recipe is vegan. When the oil is hot, add the onion and cook, stirring occasionally, until soft and translucent, about 5 minutes. Add the garlic and cook for 1 minute more, until very fragrant. Add the wine, thyme and rosemary. Raise the heat and bring the wine to a simmer. Lower the heat and allow it to simmer until reduced by about half, about 5 minutes. Stir in the beans, tomatoes, tomato paste and red pepper flakes. Raise the heat and bring the mixture to a simmer. Lower the heat and allow it to simmer for about 10 minutes, stirring occasionally. 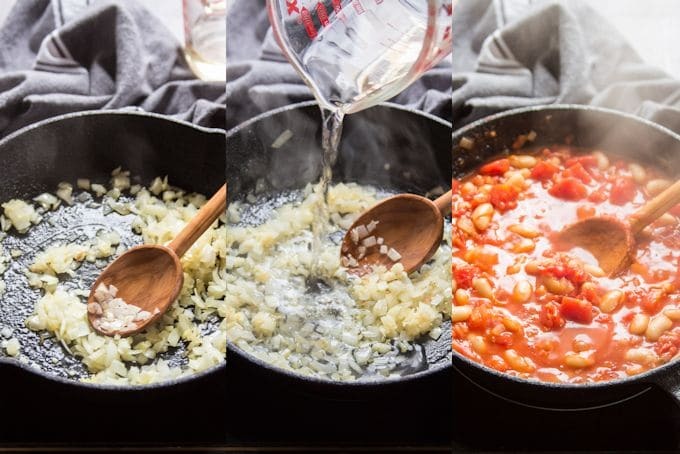 Add water to the skillet during cooking as it thickens. You want the tomato mixture to be about the thickness of spaghetti sauce. Remove the skillet from the heat and season the mixture with red pepper flakes, salt and pepper. Ladle about 1/3 of the tomato-bean mixture into the bottom of an 8 x 8 inch baking dish. Layer half of the polenta slices over the mixture. Ladle another 1/3 of the tomato bean mixture over the polenta. Arrange the remaining half of the polenta slices over the mixture. Ladle the remaining tomato-bean mixture over the polenta. Cover the dish and bake for about 20 minutes, until the sauce is bubbly. Optionally, uncover the dish, sprinkle with vegan cheese, and bake a few minutes more, until the cheese melts. Remove the casserole from the oven and allow it to sit for at least 5 minutes. 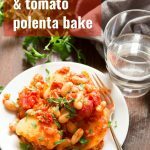 I agree with you: YAY polenta! I have never seen polenta in a tube in stores in my area. 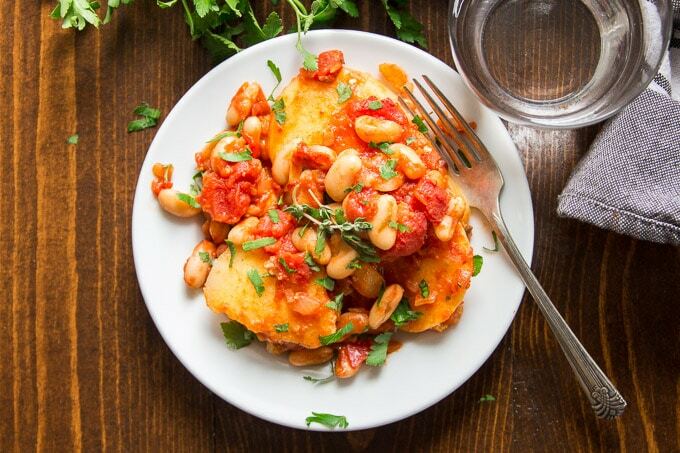 Do you have a polenta recipe to go along with this? I’m afraid not, but lots of dry polenta brands supply recipes on the back of the package – I know Bob’s Red Mill does. Found a vegan Italian polenta recipe that looked more interesting than what they offer on the package. Absolutely lovely. No leftovers here :) LOVE your recipes. Yay! Glad you enjoyed this and glad you’re enjoying the recipes! Omg, this was amazing!! I added some tempeh in the bean tomato sauce for extra protein. It was spot on: savory, delicious, and flavorful!! Oh yum! I bet tempeh bacon was excellent with this! I’m so glad you enjoyed it! Thanks so much Joseph! This was delicious and easy to prepare. A crowd pleaser! I doubled the recipe and used a lasagna pan. Will be making again!